What will you do when the next big Huntsville tornado hits? Are you prepared? Don’t leave the safety of your family up to chance. 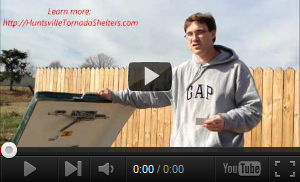 Protect your family today before the next Huntsville tornado hits with a LifeSaver tornado shelter. Call 256-258-WIND now to learn how you can get a Lifesaver tornado shelters to protect you and your family from the next Huntsville tornado. Do you sell in South Carolina? If so very interested in your product and have a few questions. How much are they and could they be used as a short term survival shelter? Look forward to your response. Thanks! Hi, constantly i used to check blog posts here in the early hours in the dawn, for the reason that i enjoy to learn more and more. How much would your smaller shelter cost without installation? Can’t find anything like this in Missouri. Would you come this far to install your product? Yes Alex, be happy to get you an underground storm shelter in Southern Indiana. Just give us a call at 256-258-WIND (9463) for exact pricing information for your location. Thanks for your comments! There are so many company out there. I do like that you don’t hide your price. I live in Hermitage TN. Have you dealt with them before or does not matter because it is in the garage? We are a family of 5. 4X4 might not work. Is there a way to actually see/feel the product? Hey Keith, all our prices are available on the PLACE ORDER page at the top of the page. FEMA guidelines suggest 5 sq ft per person for a safe room so you’re looking at 25 sq ft which is basically our 4×6 safe room or bigger. A 4×6 standard All Weather Safe Room up there would be $5,250 installed. You can view one of our safe rooms at our facility (depending on availability). Currently we have a 6×8 safe room on display. Call us at 256-258-WIND (9463) to schedule an appointment to see one. Look forward to hearing from you. Thanks for your comments! I just bought a house in Elgin, Ok. I was wondering if you guys sell in this area? Im very interested in your lifesaver shelter. how much are they?? We are 5 people in the house. Hey Emmanuel, just check out our PRICING page for exact pricing details for your address. You just need to determine how many miles you are away from Huntsville, AL and that PRICING page will let you know the installed cost. Thanks!